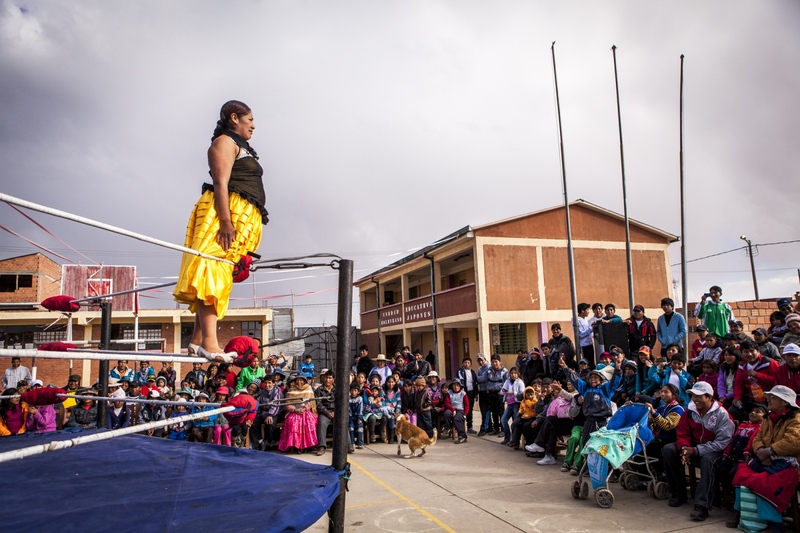 Every Sunday afternoon on the city of El Alto, once merely suburb of the city of La Paz situated at 4,150 meter high, hundreds of Bolivians and tourists cue at the door of the 12th October Sports Complex to see women wrestling. 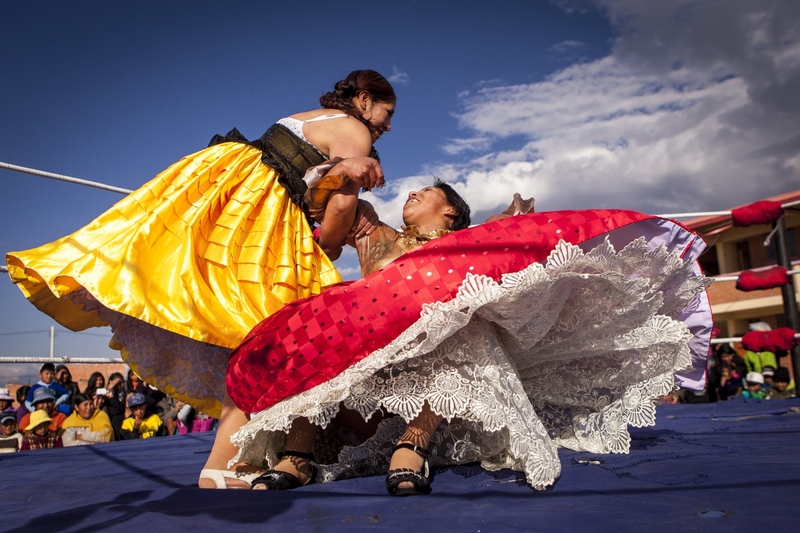 The fighting is performed by Cholitas, indigenous women that wear their pollera (a multilayers lively colour skirts), braided hair and bowler hats on the ring. In the past, women that used the pollera were repressed, isolated. 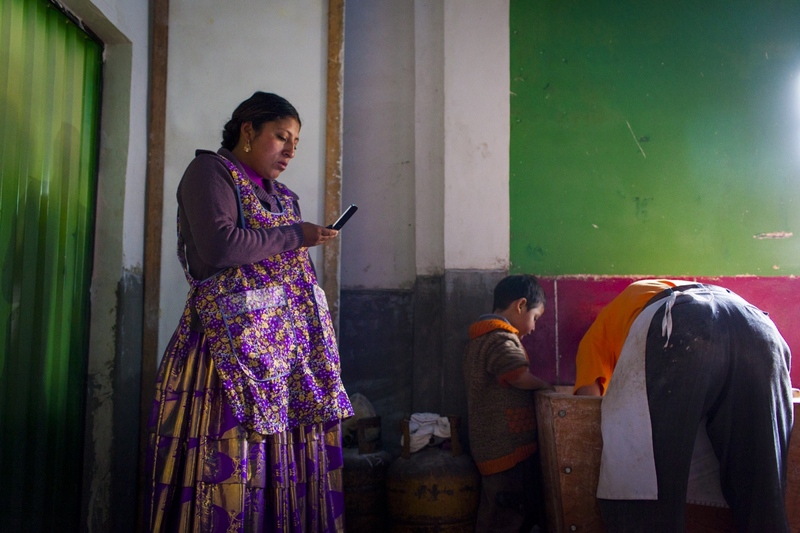 “Our ancestors would say that women on pollera couldn’t even write or read, they didn’t even have the right to learn”, tells me Mary Llanos Sanz, 31, commonly known as Juanita La Cariñosa, leader of the fighting Cholitas. Nowadays they can do anything; they are respected, and slowly they started taking essential places in the Bolivian society. It all started because the wrestling in Bolivia was not going so well. The public lost the interest in it. A fighter and promoter, Juan Mamani, had the idea to put Cholitas on the ring to attract public. Things started going well, but mostly for the promoter who kept most of the money. The women after years of exploitation decide to leave and take over their destiny. On July 2014, they formed an association where they are all responsible and where everyone has a voice. Not everything on the ring is a spectacle. The falls and the blows are real, and even if they are friends outside the ring, inside, they take it seriously. Mostly is done for the fame and glamour, since the money is too little because they have to cover the rent of the space and ring, transports and hopefully in the future insurance that they can’t afford it now. On a typical Sunday, they can earn between 150 to 200 Bolivianos (US$21-$US28). To be able to wrestle, a Cholita has to do one year of introduction to real practice. If they make that year, then they are allowed to step into the ring and fight. But the hardest part is to their boyfriends and husbands accept their sport. 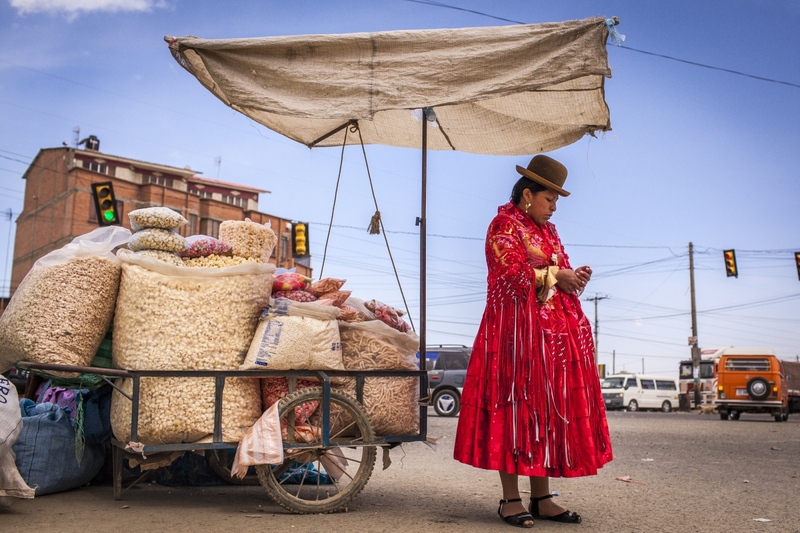 In a machismo society as the Bolivian one, men feel an inferiority complex to be with strong women, which leads to around 90% of the fighters to be separated and divorced. Many of them prefer to keep fighting on the ring and outside for their sport and their freedom as women. Reyna Torres, 22, waits at an intersection on the city of El Alto for the rest of the group so they can go together to a fight in Senkata. 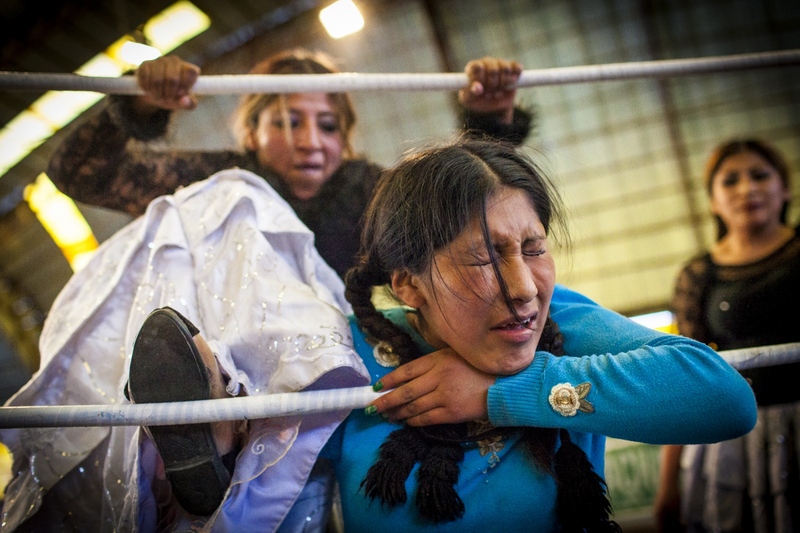 The wrestling cholitas fight every Sunday on the 12th October Complex in El Alto, but sometimes they do exhibition fights in other parts of La Paz and Bolivia to promote the sport. Silvina La Poderosa jumps from a corner of the ring to land in her opponent, Reyna Torres, during exhibit fight in Senkata, El Alto. Reyna Torres complains to the public because the referee is showing a preference for her opponent during an exhibition fight in Senkata, El Alto. Cholitas fights have always a dramatic storyline that the referee is there to help the bad cholita and usually he even participate on it. But as many other stories, most of the times the good one tends to win the fight at the end. Silvina La Poderosa, 37, looks to the public on top of the ropes during an exhibition fight in Senkata. They sometimes do exhibition fights in different locations of Bolivia to promote and attract younger people to the sport. Silvina La Poderosa, 37, and the referee punish Reyna Torres during an exhibition fight in Senkata. Cholitas fights have always the dramatic storyline that the referee is there to help the bad cholita and usually he even participate on it. But as many other stories, most of the times the good one tends to win the fight at the end. Reyna Torres grabs Silvina La Poderosa on a rotation movement during an exhibition fight in Senkata, El Alto. 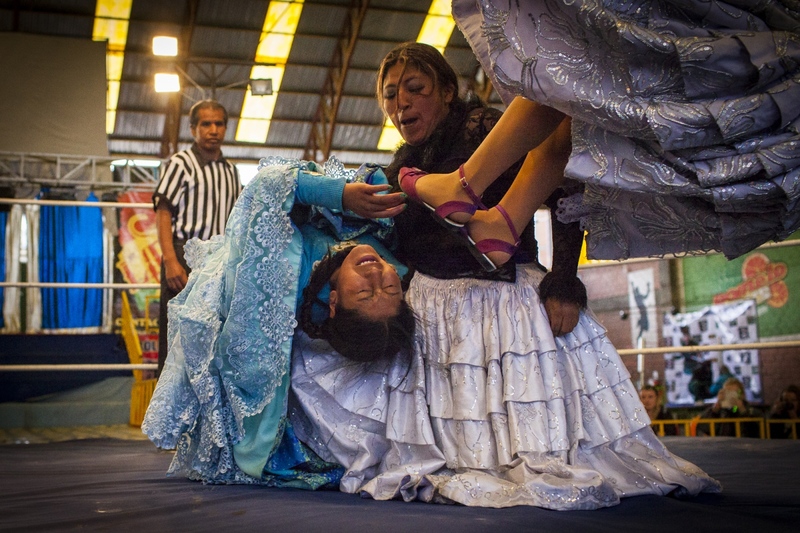 The Wrestling Cholitas fight every Sunday on the 12th October Complex in El Alto. At times they do exhibition fights in other parts of Bolivia to promote the sport. 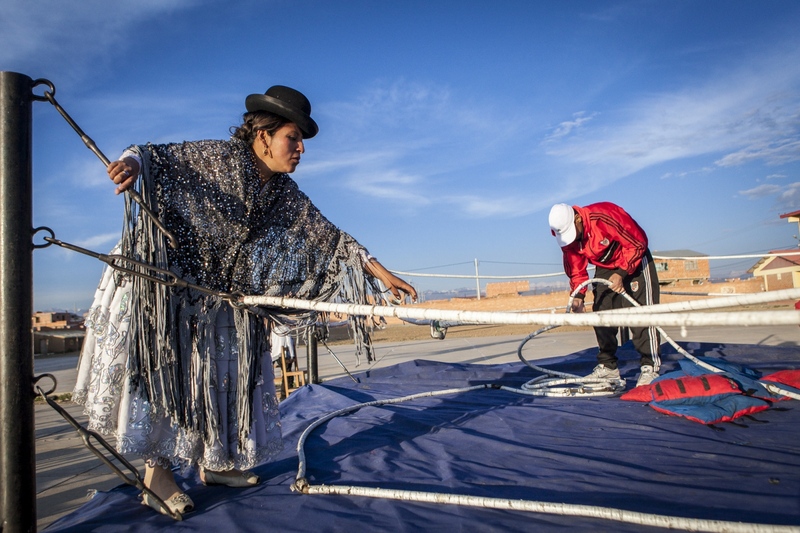 Juanita La Cariñosa helps to take down the ring after an exhibition fight in Senkata, El Alto. Due to the low budget all the fighter help doing extra work so that the fights can happen. 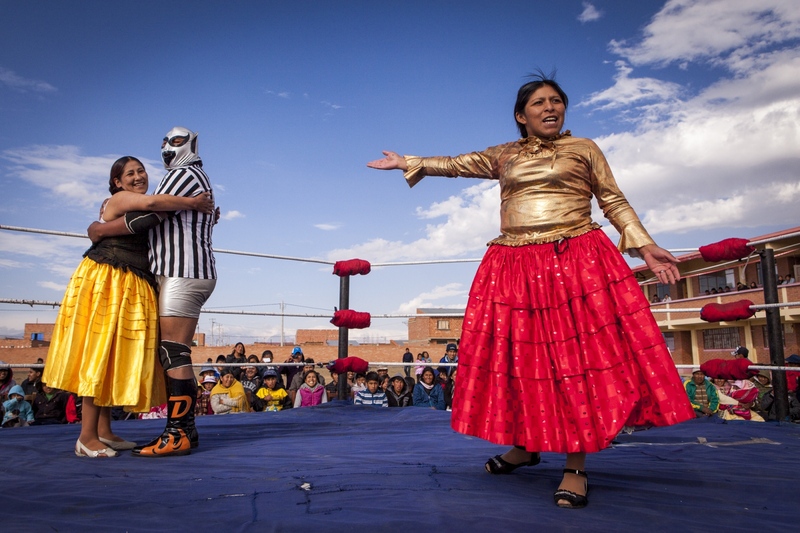 The Wrestling Cholitas fight every Sunday on the 12th October Complex in El Alto. At times they do exhibition fights in other parts of La Paz and Bolivia to promote the sport. 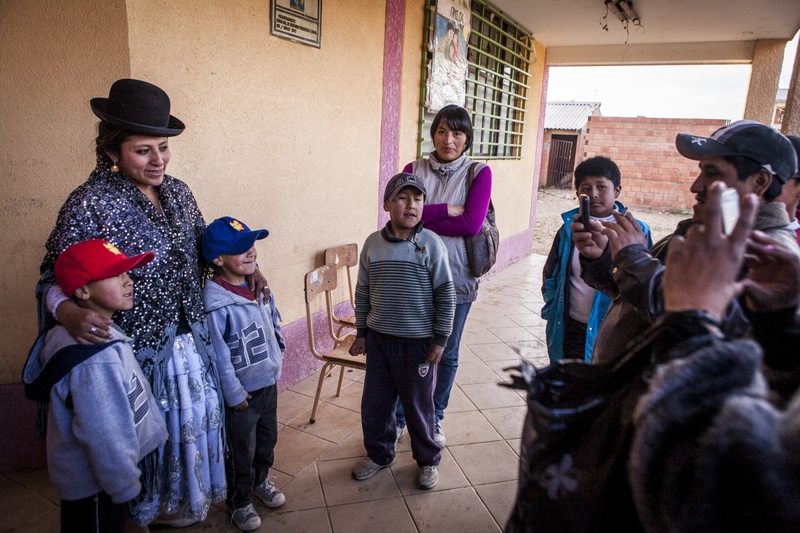 Juanita La Cariñosa takes photos with young fans after the exhibition fight in Senkata, El Alto. Cholitas got some kind of celebrity status in Bolivia but also abroad, appearing in TV shows like The Cristina Show, of the Cuban born American journalist Cristina Saralegui. Reyna Torres, takes clothes to dry on a rope in her parent’s home. When she is not fighting or involved in the organization of the fights she helps her mother in house duties. Reyna is one of the wrestling fighters part of the Cholitas Luchadoras group that fight every Sunday on the city of El Alto, Bolivia. Reyna Torres sews a skirt that was damaged during a fight. Cholitas use their every day clothes even on the ring. When she is not fighting or involved in the organization of the fights she works in her parents home. 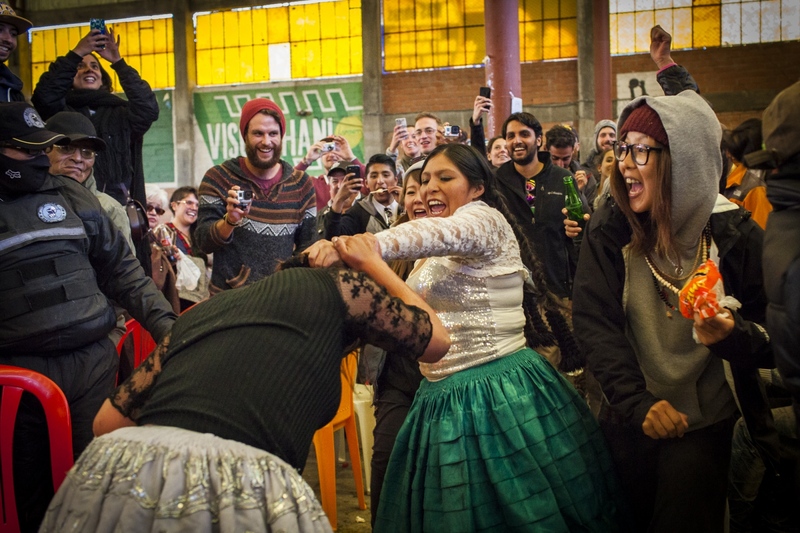 Reyna is one of the wrestling fighters part of the Cholitas Luchadoras group that fight every Sunday on the city of El Alto. Juanita La Cariñosa using her phone to coordinate fights while she was cooking bread for All Soul's Day. Being a wrestling cholita, takes much of her personal time, since she has to organize fights, coordinate everything with the other cholitas and try to get tourists to the events since they are the ones that really bring money to the sport by paying up to five times more than a Bolivian. 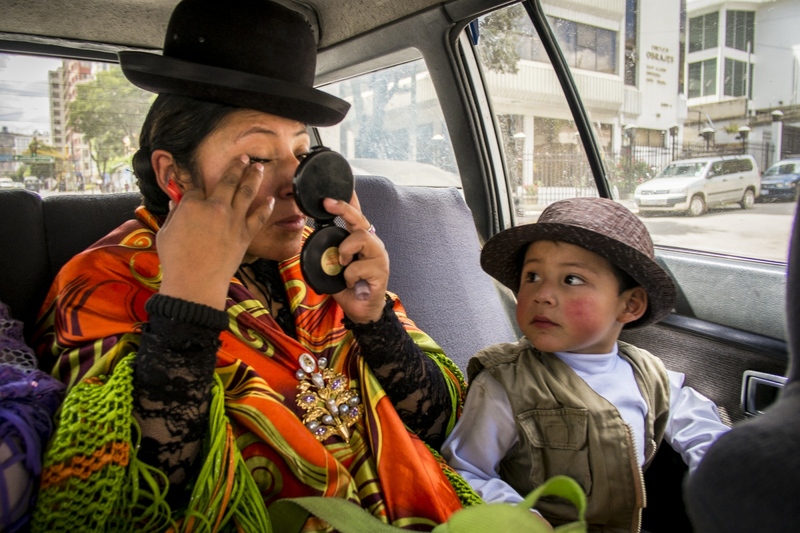 Mary Llanos Sanz, 31, best know as Juanita La Cariñosa (The Sweet One) the leader of the Wrestling Cholitas, puts make up on a taxi ride on the way to a fight while her little son looks at her. Juanita La Cariñosa controls the tickets at the door of the 12th October Sports Complex in El Alto. The tickets fee are the only income that supports the fights, specially the profit made from tourists since they pay, 50 Bolivianos ($US7.5) to the 12 Bolivianos ($US1.75) paid by locals. 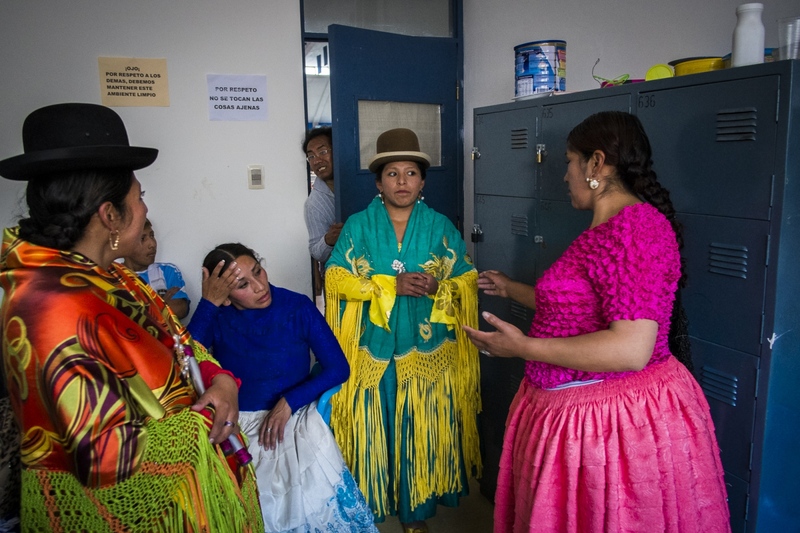 Cholitas meet up on the dressing room before the match so they can coordinate the order of fights and some of the sequences. 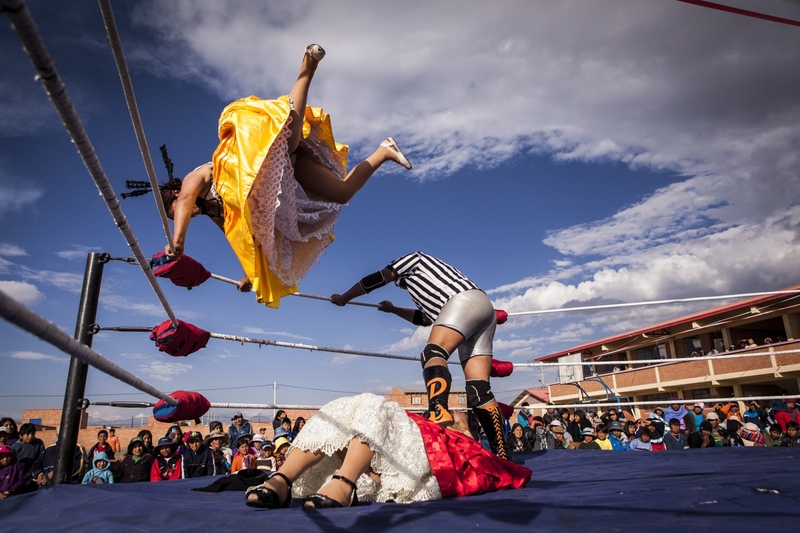 The Wrestling Cholitas fight every Sunday on the 12th October Complex in El Alto. 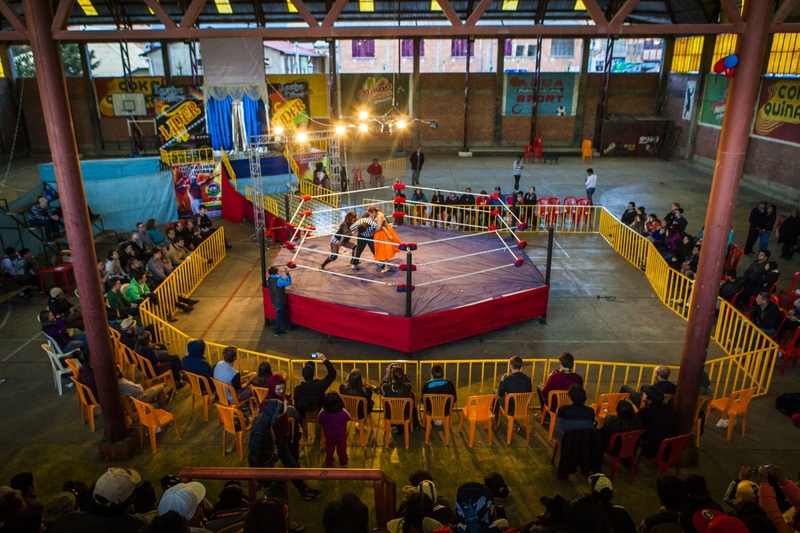 At times they do exhibition fights in other parts of La Paz and Bolivia to promote the sport. The ring of the 12th October Sports Complex, where cholitas fights happens every Sunday. 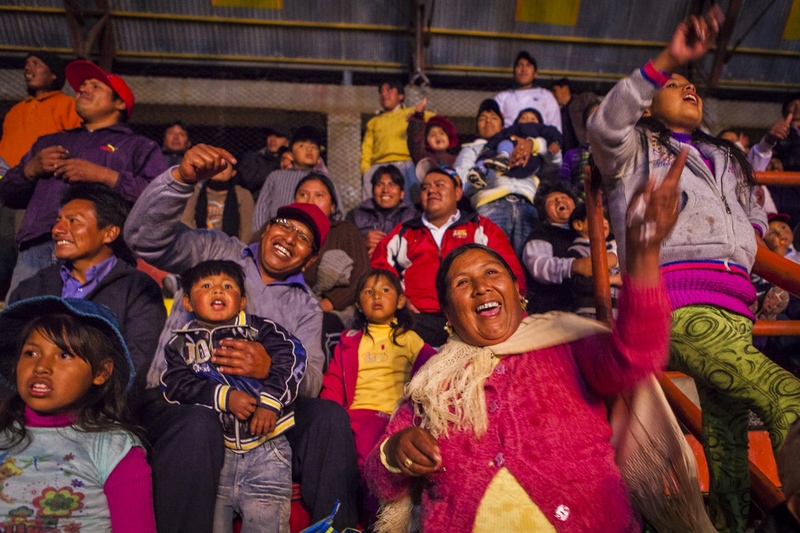 The fights attract many Bolivians and tourists. Tourists pay five times higher prices to sit in the front rows on plastic chairs, while the locals sit on the cement stands. Juanita La Cariñosa and Simpática Sónia, 21, (Nice Sonia) punish Jennifer Dos Caras (Two Faces), 16, during a fight on the 12th October Sports Complex in El Alto. Sometimes fights are fought in pairs, being one team the bad and the other the good one. As in many other stories, most of the times the good side tends to win in the fight at the end after suffering a lot. 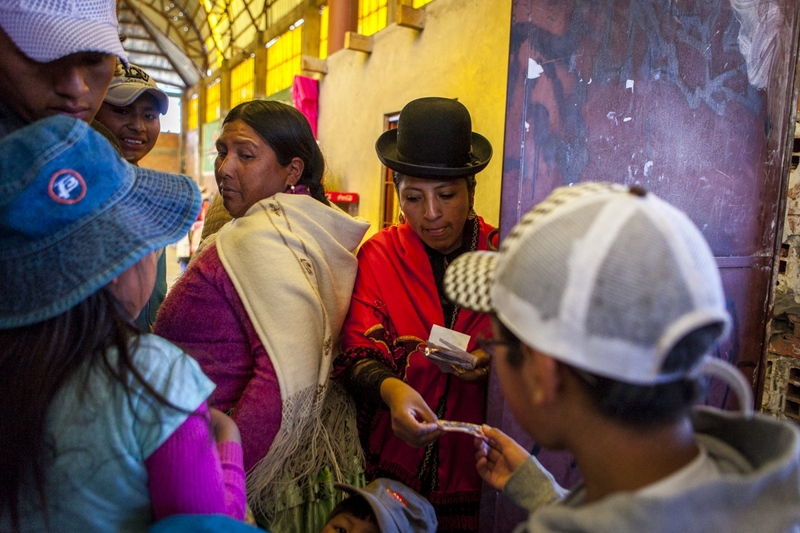 The Bolivian public cheers the cholitas during a fight in the 12th October Complex in the city of El Alto. To many people in town going to see the fights of the Cholitas is their favourite Sunday past time. Juanita La Cariñosa punishes Jennifer Dos Caras (Two Faces), 16, on the ropes during a fight on the 12th October Sports Complex in El Alto. Sometimes fights are fought in pairs, being one team the bad and the other the good one. As in many other stories, most of the times the good one tends to win the fight at the end after suffering a lot. Reyna Torres comes to the rescue of Jennifer Dos Caras and punishes Juanita La Cariñosa outside of the ring for delirium of tourists watching the fight. Sometimes fights are fought in pairs, being one team the bad and the other the good one. As in many other stories, most of the times the good side tends to win the fight at the end. 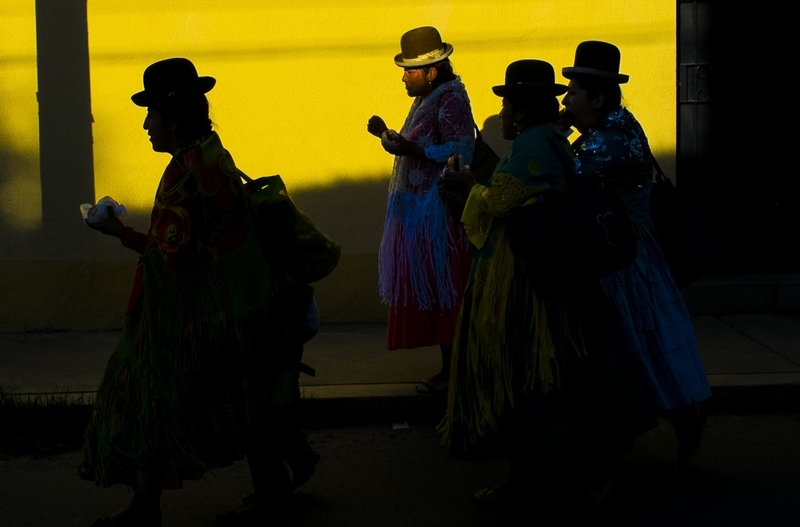 Cholitas walk on the street at sunset after an exhibition fight on the rich part of La Paz. The wrestling cholitas fight every Sunday on the 12th October Complex in El Alto, at times they do exhibition fights in other parts of La Paz and Bolivia to promote the sport.